Superstar designer Betsey Johnson's rose-adorned creation. MIDTOWN — Handlebars clad in python print and wheels adorned with sequins were all the rage in the Garment District Wednesday as some of city’s top designers unveiled fashion-forward bike designs that will be rolling through Manhattan this Fashion Week. Beginning tomorrow, fashionistas will be able to borrow one of 30 handmade bikes embellished by some of the city’s biggest names in fashion, including Betsey Johnson, Isaac Mizrahi, Diane von Furstenberg and Yeohlee. 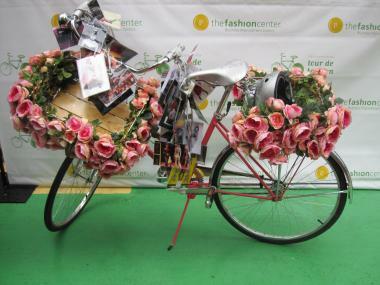 The “Tour de Fashion” bikes will be available through September 15 to pick up and drop off at two locations: in the Fashion District at Broadway and 40th Street, and in the Meatpacking District at Ninth Avenue and West 14th Street. Superstar designer Betsey Johnson shows off her colorful Fashion Week wheels. While the rides are free for an hour, cyclists will be charged $1,100 if they fail to return the wheels, said Barbara Randall, president of the organizing Fashion Center BID, after the designers unveiled their creations at a preview Wednesday. Superstar designer Betsey Johnson couldn’t wait to show off her fancy wheels, which she painted hot pink and adorned with at least 100 giant, puffy flowers, reminiscent of her shows. “You knew I’d do pink roses,” said Johnson, smiling wide as she displayed a collection of photographs of her life, designs and famous friends that she strung from the handlebars. “It’s my life as streamers,” she explained, while wearing a hot pink and black striped shirt, and a custom helmet featuring the skyline of New York. Garment District advocate and designer Nanette Lepore, who decked out her bike with bright lime-green and fire-engine red, said she based her design on her spring line. “It reflects the show and the colors and brightness and excitement,” said Lepore, who added she loved the idea of the bike share, which she hopes will help promote fashion in the city and keep manufacturing in place. Another district-based designer, Yeohlee, adorned her bike with pictures of cutter ants, which are also the inspiration for her spring collection. “NYC is an anthill,” said Yeohlee, who hopes the bikes serve as inspiration to everyone who sees the designs. Designer Gretchen Jones, of "Project Runway" fame, clad her designer wheels in wood paneling, inspired by an old “woodie” car. “I wanted to use a material you wouldn’t expect,” said Jones, who also custom-made her bike's pedals with cut-outs — to accommodate heels. Jones, an avid cyclist who bikes every day from her Brooklyn home to her studio at 25th Street and Broadway, said that cycling and fashion can go hand-in-hand. Randall said with biking such a hot-button issue in the city, it’s only natural for the fashion industry to embrace the trend. But she noted that while the BID wants riders to show off their designer wheels, they will be encouraged not to leave the bikes unattended, even when locked, for fear of them being stolen. At the end of the week, the bikes will be auctioned off, with proceeds going to the CFDA’s Fashion Incubator, which helps emerging designers launch their brands. The bikes will be available to borrow for an hour at a time from Sept. 8 through Sept. 15, weekdays from 10 a.m. to 6 p.m. and weekends from 11 a.m. to 6 p.m.